In this third and final installment of our fitting series, we’ll see how all the previous fittings converge into a wearable shirt. At the end of Part 2, the body of the shirt was falling into place, with the sleeves and neckline becoming the major issues of focus. We’ll tackle those, and show actual fitting photos of the BF Oxford Shirt. (Here’s a link to Part 1 and a photo gallery of the finished shirt if you are new to this series). Everything is finally looking OK. That horizontal balance line in front appears tilted, but it’s really posture and camera angle and not the garment. 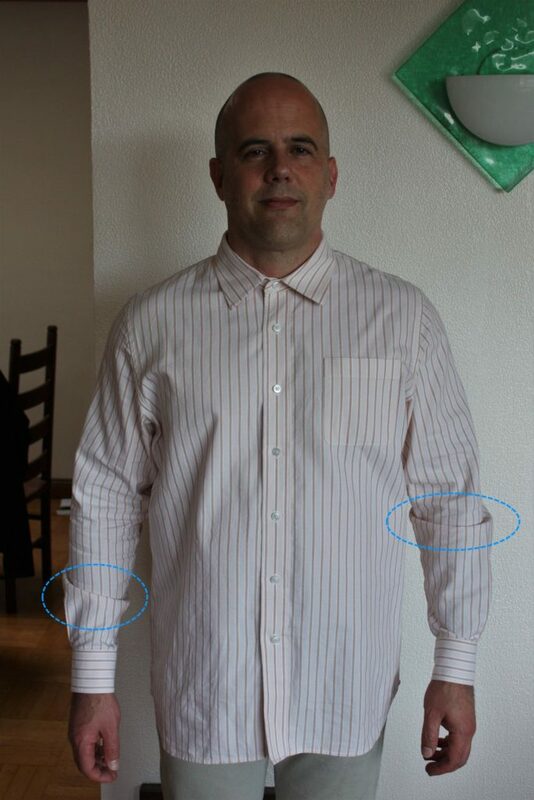 The client reports the sleeve is OK. Length, reach and ease issues seem resolved. If you look at the sleeves on the front fitting photo, you will see that the horizontal balance line isn’t level. In fact, it tilts upward as it runs from the body towards outer arm. That is what is causing the diagonal drag outlines in that area, because the fabric in this area is now hanging off grain. But in this case the drag lines are intentional (or, I should say “accepted”). Flattening and widening the sleeve cap to add ease and comfort also lowers the sleeve cap height. Lower sleeve cap height causes the horizontal balance line to pull upward and create those wrinkles. Sleeve fit is a tradeoff between looks and comfort. 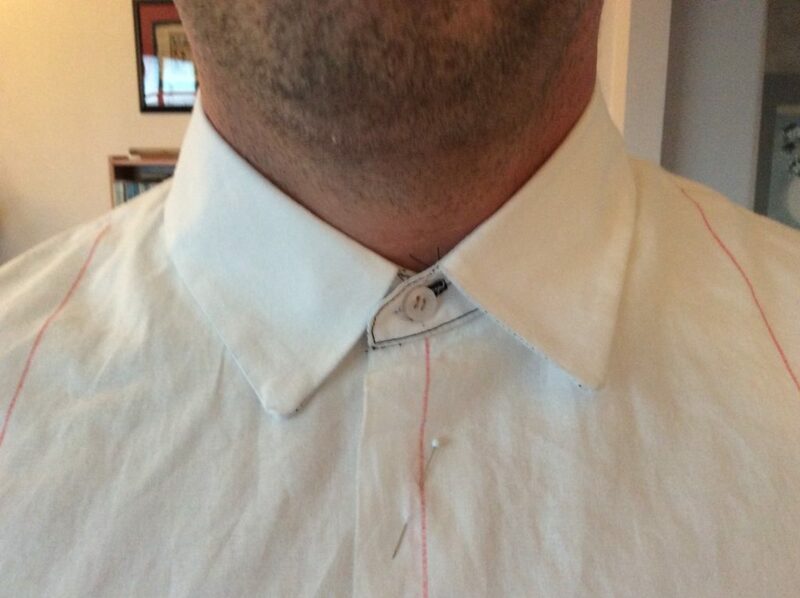 When judging the collar fit, I take the time to add a real button and buttonhole to the collar stand in the muslin. This is extra time and work, but for me it’s worth it. The button is more accurate than attempting to pin the collar so that center fronts line up. With Muslin F the collar is in the proper place at back, but is now too tight in front. 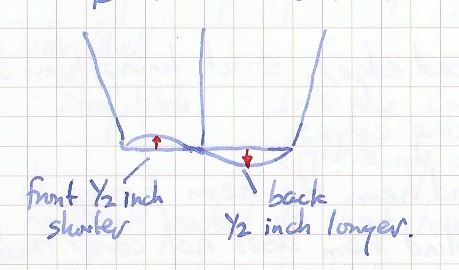 I needed to move the front neckline curve forwards more than I had guessed. I am also not quite happy with the Ben Sherman-inspired collar. The collar blade is too big. I draped in new shape for the collar blade (which you can see outlined with red marker in the fitting photo) for the next muslin. Here is what the collar looked like after I marked out the dotted lines you can see in the photo above. I had to update only collar and neckline. Rather than making a new muslin, I picked apart Muslin F and recut the neckline of the front piece. Then I sewed the muslin F back together with the updated collar. I’m calling this muslin “F+”. I lowered the neckline another 1/4 inch in front. This fixes the mistake I made when I shifted the neckline forward, as well as giving yet a bit more ease to make the collar comfortable in front. Muslin F+ changes only the neckline and collar. 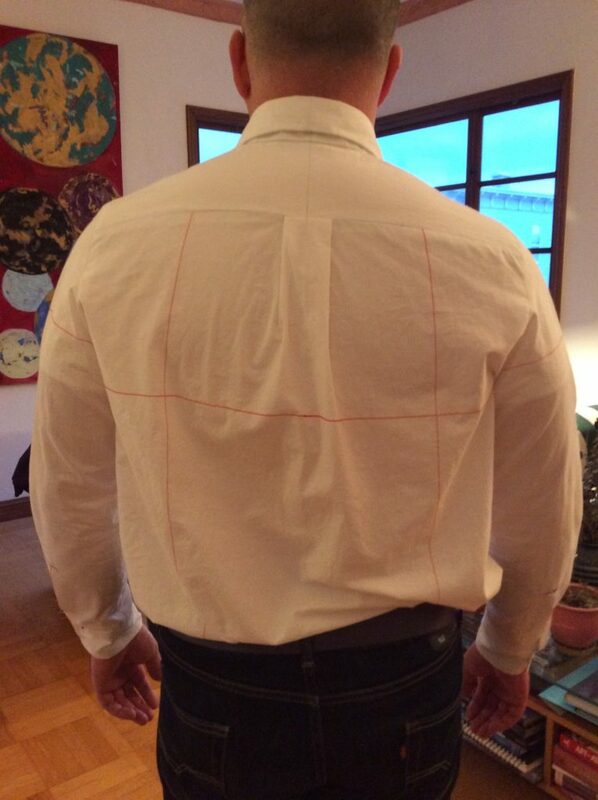 The neckline finally fits the client from a comfort and looks point of view. 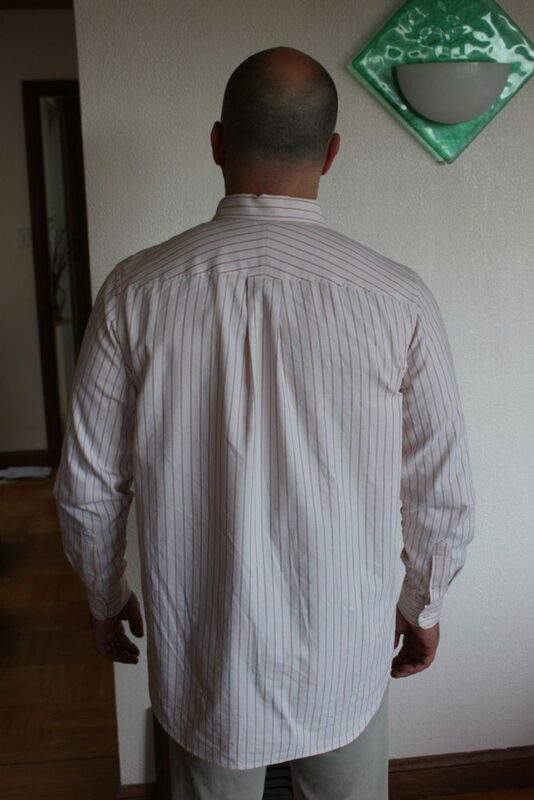 The photo still shows a bit of a gap in the back, but I didn’t want to take the neckline in too close. And this decision is vindicated by the fitting photos of the wearable muslin, farther below. I am still not happy with the reduced Ben Sherman collar. The collar blades are too small for a dress shirt, but they would be OK for a work shirt. 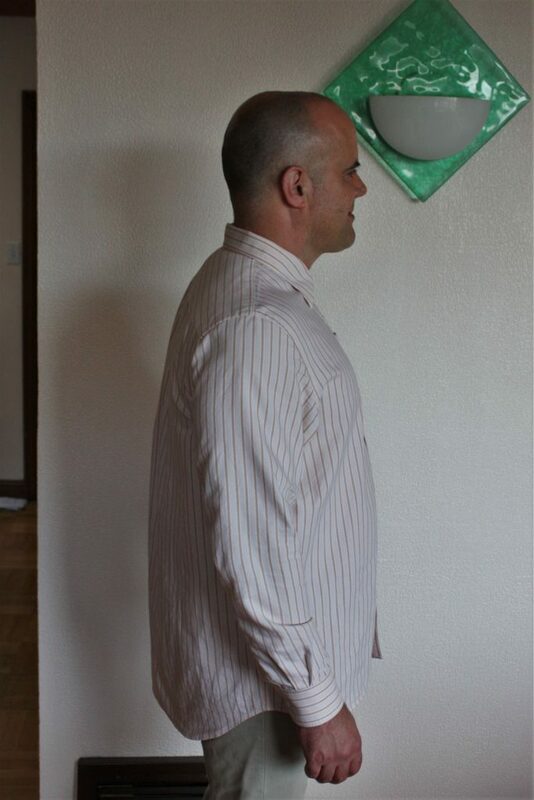 I plan to do the work shirt as a future project, but I want a dress shirt as a starting point. At this point, I am ready to commit to making a real shirt from actual fashion fabric – Wearable Muslin A. 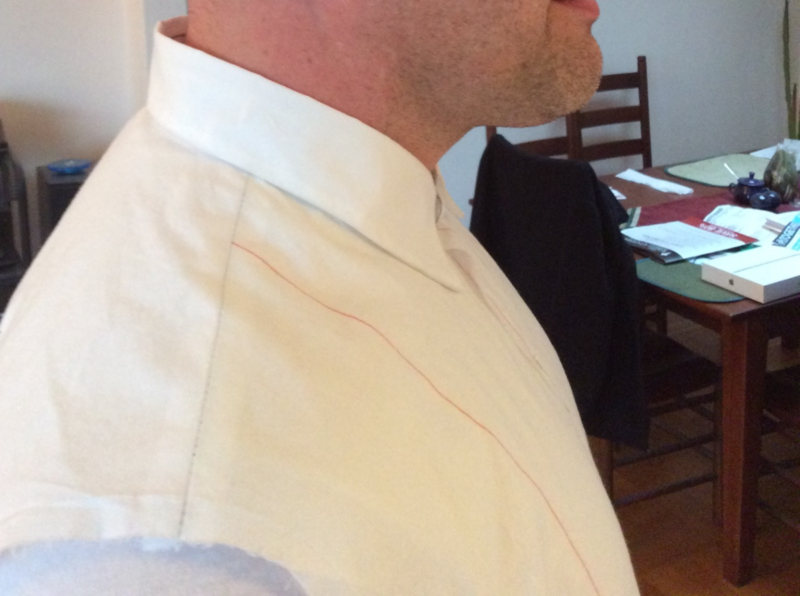 Going for a classic look, and setting aside the quest for the perfect collar style, I abandoned the work-in-progress Ben Sherman collar in favor of a collar and stand traced from a Land’s End shirt. I made some adjustments to the sleeve. To accommodate the sleeve placket, 1 inch in width needs to be removed at the cuff line – as the placket adds this width back. Sadly for me, I made a mistake and added an inch instead. Luckily since the mistake added fabric, I was able to fix this on-the-fly by trimming the sleeve down a bit. 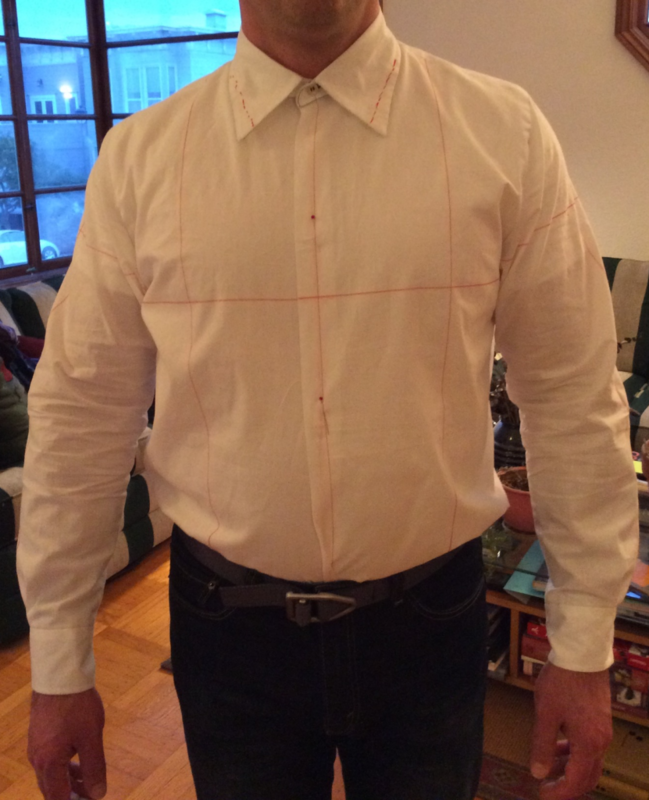 The Oxford Shirt is quite wearable, but no project is ever perfect and there are still some fitting tweaks to be made. The fit is perhaps a bit narrow across the back – the box pleat is slightly open even when client is not reaching forwards. This is likely a result of the pattern changes to raise the yoke seam, where I brought the armscye curve in slightly. The pleat makes everything work, but I’d prefer to have the pleat look collapsed when the wearer has their arms down and isn’t reaching out. Side views are looking okay. The grain lines denoted by the stripes, especially in back, look a little tilty. 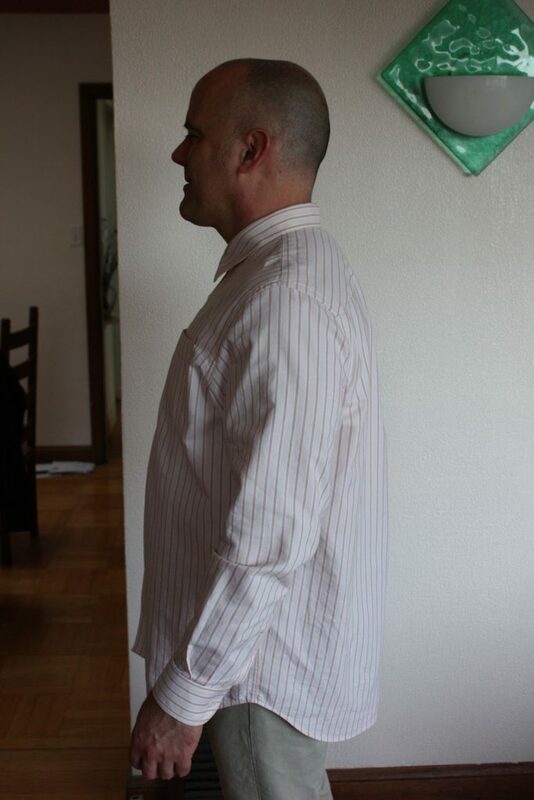 But overall I am satisfied with the way the body of the shirt hangs, and there are no significant wrinkles or pulls. The grainline of the sleeve is hanging perfectly. I think this has finally been nailed. 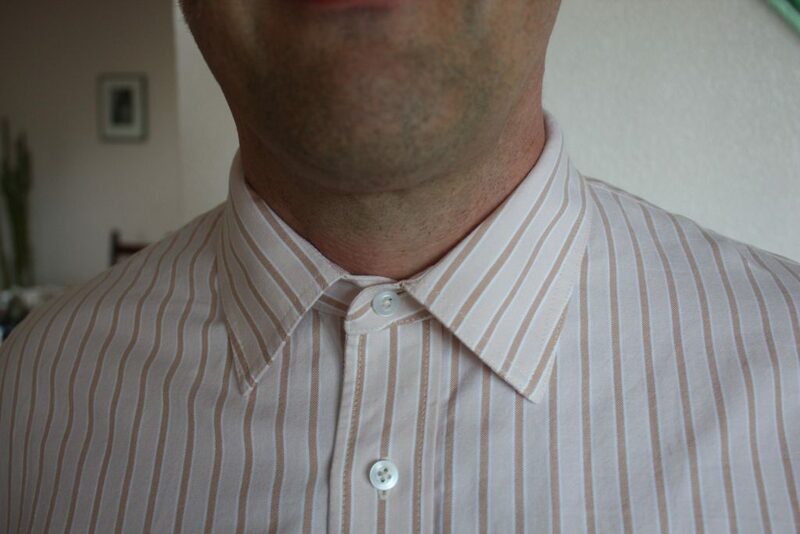 The client reports the collar feels comfortable when buttoned, and there are no big gaps front or back. I think the biggest issue to tweak going forward is the sleeve. One issue, which is mostly stylistic, is the amount of ease, particularly in the forearm area. The forearm has relatively little ease and is mostly form-fitting. While that’s on-trend, the client and I both agree we should add more ease in this area, and increase the number and depth of the pleats going into the cuff. 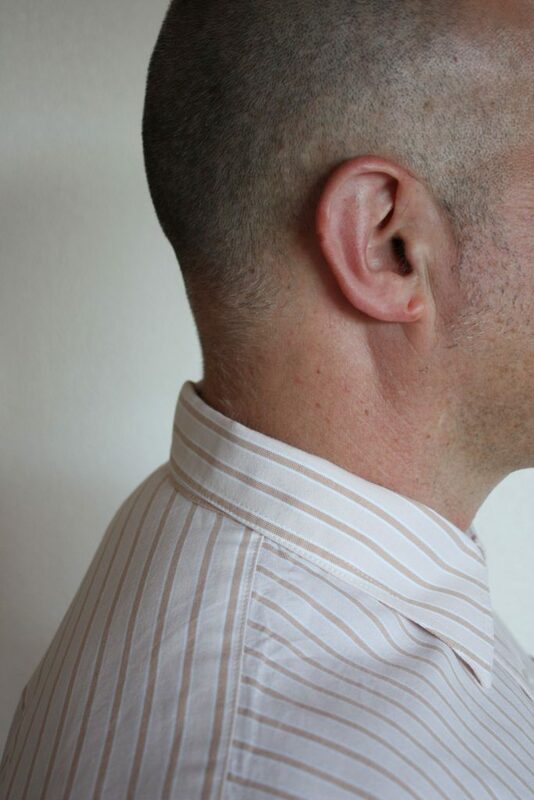 There’s about 2 inches of ease into the cuff; David Coffin’s book suggests 3-5 as appropriate for a dress shirt, so there’s room to add in this area. The side view suggests there’s a bit too much length at the front forearm, and not enough in the back. This issue might – and I’m guessing might – be addressed by sculpting the sleeve a bit. Lengthen the cuff in the back, and shorten it a bit in front. This is a common tweak made to sleeve patterns, lengthening the back and shortening the front by up to 1/2 inch on each side. The result is a pattern with a wavy shape at the cuff. Here’s a little sketch to illustrate. Finally the client had their own things to say about the project. Jim rarely wears shirts tucked-in; he says when he does that, people at work think he is out interviewing for a new job. I intentionally gave the shirt long tails, but at his request I plan to raise the hem on the shirt to make it appropriate to wear untucked. He also wasn’t happy with the curve in the collar blades, which have a tendency to curl. This curve is actually built into the collar by sewing technique, stretching and easing the layers while running them through the machine. Perhaps I’m overdoing it. It’s something I’ll pay attention to in future projects. This entry was posted in Clients, Completed Projects, Pattern Fitting, Shirts and tagged bf-oxford-shirt on June 30, 2017 by mportuesisf. WOW! So well put together and dashing, the final reveal is a credit to your taste in men. The shirt is a looker too. Just lightly spray starch the back pleat inside and out, it should hang better. Thank you for the advice! It does makes sense and I am always looking for suggestions to further my fitting skills.